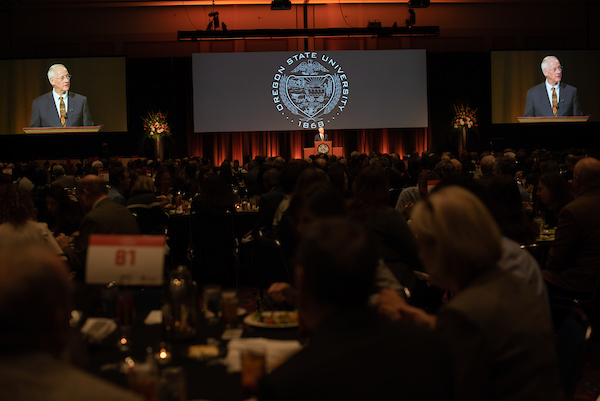 Oregon State University President Ed Ray used his 2019 State of the University speech as a platform to make a pitch for more state funding for higher education. Scientists expect a major earthquake along the Cascadia Subduction Zone, and it may give a warning. Research shows swarms of small quakes may act as harbingers of much bigger seismic events. Oregon State University Professor John Nabelek in the College of Earth, Ocean, and Atmospheric Sciences worked on the research project into the Blanco Transform Fault. To assess the state of the world’s megafauna, a team of international researchers led by scientists from Oregon State University surveyed the populations of 292 large animal species. Of these, 70 percent, or just over 200, were classified as decreasing in number, while 59 percent, or 171, were deemed at risk of extinct. Gov. Kate Brown said Thursday there might be up to $100 million in extra bonds for university construction projects in 2020 — an amount that would likely ensure funding for the proposed Student Success Center at Oregon State University-­Cascades in Bend. The troupe's traveling company pulls into Corvallis for a performance at 7:30 p.m. Friday at the LaSells Stewart Center on the Oregon State University. It's the latest performance in the "SAC Presents" series presented by OSU's School of Arts and Communication. The work, which portrays the six days of God's creation, beginning with an orchestral portrait of chaos and ending with the birth of a new world, represents the sternest musical challenge yet for the Repertory Singers, said Steven Zielke, the artistic director of the Repertory Singers and the Patricia Valian Reser professor of music at Oregon State University. And while it can be tempting to try to gloss over the issue – especially if the child is very young – Dr Shauna Tominey (OSU), author of a new book, "Creating Compassionate Kids: Essential Conversations To Have With Young Children," says tackling the tough stuff is often good for the parent-child relationship. Rummage Sale: EESC will host a rummage sale in the fourth-floor foyer of Kerr from 8 a.m. to 5 p.m. Feb. 4-8 to support the annual food drive. Peruse housewares, books, movies, toys, clothing, and more. For questions, contact Noelle.Mills@oregonstate.edu. This event is part of the OSU Food Drive. PB&J Bar: Choose from a variety of jelly, jam, butters and honey to make your PB&J. Feb 4-8 stop by Gilmore Hall 116 from 8 a.m. to 5 p.m. to make your sandwich. Thanks to New Morning Bakery for their generous donation. Suggested donation of $1-5 based on what you can afford. FMI email jennifer.cohen@oregonstate.edu. This event is part of the OSU Food Drive. OSU International Scholar and Faculty Coffee Social: OSU Folk Club, Crossroads International and OSU Office of International Services would like to invite you to join international visiting faculty, scholars, students and their families for conversation, coffee, tea and light snacks at the Corvallis Multicultural Literacy Center (CMLC) in the Einerson House (EINH), 2638 N.W. Jackson Ave, Corvallis. on Friday, Feb. 8, from 10:30 a.m. to noon. Cheese sales: You know what goes down well after midterms? Fill your belly with Beaver Classic Cheese this Friday from 11 a.m.- 1 p.m. just inside the front entrance of Withycombe Hall. We have five types of cheddars, two Swiss, two provolones, and our famous cheese curds. Did we mention we have samples. Warm up with a cup of piping hot chocolate from OSU’s Creamery. All proceeds of the hot chocolte benefit Linn-Benton Food Share. The milk is from OSU’s own campus cows and lovingly made by Food and Fermentation Science students. Top Hat Faculty Panel: Panel on how OSU instructors are using the Top Hat student response system for active learning, and how they are managing personal devices in the classroom. Questions and healthy skepticism are invited. Friday Feb. 8, 11 a.m. to 12:20 p.m. in Kidder 202. Refreshments will be served. The session will be available via Webex and will be recorded. Register here. Questions? lynn.greenough@oregonstate.edu. Meat Center: The Clark Meat Science Center retail store will be open Friday from noon-5:30 p.m. Products include fresh and cooked/smoked sausages, bacon, retail cuts, jerky, snack sticks, and Beaver Classic cheese. The store is located at 3260 SW Campus Way, next to the Motor Pool. Contact Nathan.Parker@oregonstate.edu for questions regarding the store. UPDATED LOCATION! Budget conversation: On Friday, Feb. 8, at noon the Office of Budget & Fiscal Planning will hold another University Budget Conversation in the Memorial Union 109. This week’s topic is about the FY19 budget reductions and FY20 outlook. The budget conversations sessions are limited to 60 minutes and are an open forum structure with the initial 15-20 minutes spent on presentation of the topic, leaving time for discussion and Q&A. We encourage you to bring your lunch and join the conversation and to learn more about OSU’s budgeting and fiscal matters. A budget brief (handout) will be available on Friday. More information about University Budget Conversations can be found on the Office of Budget & Fiscal Planning website. If you have questions, contact Sherm Bloomer for more information. For details on attending the meeting via conference call contact Kayla Campbell. Soup lunch: Join us at noon Feb. 8 in ALS 3006 for hot soup to warm your soul. Crop and Soil Science Soup Lunch. Come by and enjoy some hot soup. $5 suggested donation. For more information contact emmalie.goodwin@oregonstate.edu. This event is part of the OSU Food Drive. OSUsed Store Public Sales: The OSUsed Store is open for its weekly public sales Friday noon to 3 p.m. at 644 S.W. 13th. Personal purchases must be made during public sales. Staff may shop for their department 8 a.m. to 4 p.m. Mondays through Thursdays. More information on our website. Graduate Research Showcase: Join the OSU College of Engineering for the 2019 Graduate Research Showcase. Feb. 8, 1:30 to 4:30 p.m. at the CH2M Hill Alumni Center. Admission is free and open to the public. For more information, visit: engineering.oregonstate.edu/2019-graduate-research-showcase. CANCELED! Faculty Grant Training: This event has been canceled. Wikipedia Editathon: “Writing African American History into Wikipedia.” No experience necessary. Organizers give you everything you need to help add to the historical record in Wikipedia: topics, information and a Wikipedia account. Register now and find out more at tinyurl.com/WikiEditOSU. All are welcome. Hosted by the OSU Libraries in partnership with AfroCROWD. Feb. 8, 2 p.m., Valley Library, Autzen Classroom. MIME Distinguished Speaker - From Energy Access to Grid Resiliency: A Story of Anthropology, Engineering, and Business: Nathan Johnson, assistant professor at the Ira A. Fulton Schools of Engineering at Arizona State University and director of the Laboratory for Energy And Power Solutions (LEAPS), will discuss opportunities for innovation with global impact by beginning with methods that capture and interpret user insights before diving deeper into four synergistic project areas that each connect user insights with technical research to the delivered product. Friday, Feb. 8, 4 p.m., Rogers Hall, 226. Panda Express Night Supporting HC Food Drive Looking to eat some delicious orange chicken AND donate to the Linn-Benton Canned Food Drive? If you stop by the Panda Express in the MU on Feb. 8 between 4-9 p.m., pick up some dinner, and mention the fundraiser to the cashier, you can do both: 100 percent of the earnings from this fundraiser (20 percent of sales) will go straight to Linn-Benton Food Share. This event is part of the OSU Food Drive. The North American Truffling Society Meeting and Potluck: Our annual potluck begins Feb. 9 at 6 p.m. at the Corvallis Senior Center, 2601 N.W. Tyler St., Corvallis. Bring a dish to share (if possible, provide a list of ingredients for those on restricted diets), tableware, and the beverage of your choice. NATS provides coffee and tea. The speaker will be Amy Rossman, who will present her jungle experience in "Collecting fungi in the Amazonian Cerra de la Neblina, Venezuela." Water Battleship: A unique version of a childhood game will come to life on Feb. 9-10 at Oregon State University. Intramural Sports is hosting a “Water Battleship” game in the Dixon Recreation Center Pool, where four teams of three-to-four players battle against each other in canoes. Each team has buckets and a shield, and attempt to sink the other canoes by tossing water into opposing teams’ canoes. The event takes place at 2 p.m. Feb. 9 and 11 a.m. Feb. 10. Last Winter 2018 was the first time the competition was held, and organizers hope the public comes to watch the fun this year at the pool. For a sneak peek, see this promotional video from last year: https://www.youtube.com/watch?v=tq4tC3W2y50 To speak with organizer Colby Schoniwitz, call 541-737-3569 or email RecSports.SSPA1@oregonstate.edu. NEW! Guitar concert: Classical guitarist Scott Kritzer will perform as part of Oregon State University’s Guitar en Route concert series at 7:30 p.m. Tuesday, Feb. 12 in Room 303 in Community Hall, 1650 SW Pioneer Place, Corvallis. Guitar en Route is a new concert series presented by OSU guitar instructor Cameron O’Connor and the OSU guitar program. Kritzer has been a featured performer with the Oregon Symphony, the Sunriver Music Festival Orchestra, the Cascade Festival Orchestra and the Coos Bay Festival Orchestra. He has served as artistic director of the Portland-based Third Angle contemporary chamber music ensemble and has performed at concert halls and festivals throughout the world. The performance is free and open to the public. Space is limited; visit http://liberalarts.oregonstate.edu/musicevents to RSVP. NEW! Dylan conversation: “Bob Dylan and 1960s America: A conversation with historian Sean Wilentz” will be held at 7 p.m. Wednesday, Feb. 13, in The LaSells Stewart Center. Wilentz is the George Henry Davis 1886 Professor of American History at Princeton University, where he has taught since 1979. His writings on music have focused on folk traditions and contemporary rock and roll, especially the work of Dylan. The talk is free and open to the public. The LaSells Stewart Center is at 875 SW 26th St., Corvallis. For more information: https://liberalarts.oregonstate.edu/60s-decade-changed-america. NEW! After the Fire Presentation: Shawn Simons and Alvaro Llanos, two former students from Seton Hall University, will share their inspiring story along with a documentary film of surviving a deadly dorm fire that occurred nearly 20 years ago on the Seton Hall campus. Three students were killed and 56 people injured, including firefighters and residents. Feb. 27, 7 p.m. in The LaSells Stewart Center. This event is sponsored by OSU Department of Public Safety & Environmental Health & Safety and is free. Behind the Scenes Recycling Tour: Want to know what happens to recyclables after they hit the bin? Get a behind the scenes look on Tuesday, Feb. 12, 3:30 to 4:30 p.m., on the south side of campus. Learn more and register in advance here, or contact Andrea Norris for questions at 541-737-5398 or andrea.norris@oregonstate.edu. The 4th annual Human Library: The Human Library event will be held on Wednesday, Feb. 13, 10 a.m. - 3 p.m. in the Valley Library, 4th Floor Rotunda. Event participants will engage in 45 minute two-way conversations with individuals who volunteer as “Human Books.” Experiencing a discussion with a human book creates an opportunity for constructive dialogue, learning, and empathy between two people who otherwise might not interact. A list of books and registration for “Readers” are available at https://guides.library.oregonstate.edu/humanlibrary. Preregistration is strongly encouraged. Please direct accommodation requests related to disability or general questions to Shalece Rains at 541-737-4537 or shalece.rains@oregonstate.edu. BEavers HERE NOW Drop-In Meditation: Mondays through Fridays, weeks 2-10 at 1 p.m.,, in the Craft Center. No experience necessary. All are welcome. Enjoy a different 15-minute guided meditation each week. Benefits of mediation include stress reduction, better sleep, sharper concentration, anxiety management and happier relationships. Contact tess.websterhenry@oregonstate.edu to coordinate extra credit for student attendance. Faculty and staff are welcome too. Stay after meditation for a mindful art activity hosted by the Craft Center. NEW! Beaver Family Connections: Tools & Strategies to Practice Emotional Intelligence: From happy to sad, frustrated to excited, angry to calm, children have many different emotions (and so do parents). In this interactive workshop, OSU’s Shauna Tominey will talk about hands-on strategies parents can use to help children learn to manage their emotions. This session will be on Tuesday, Feb. 12 from noon to 1p.m. in MU 207. For a calendar of this year’s Beaver Family Connections please visit https://familyresources.oregonstate.edu/bfc and for questions please contact familyresources@oregonstate.edu. NEW! Digital Community Meeting: Join OSU’s community of digital workers to hear the latest on DX and web governance, and we’ll talk about some of the big (and small) spring cleaning tasks you can do on your website. Learn more at Drupal@OSU. We welcome all who work on the internet at OSU. Feb. 12 from 2 to 4 p.m. in Cascade Hall 136. NEW! Crop and Soil Science/Horticulture Winter 2019 Seminar Series: Sara Kincaid, entomologist for the Oregon Department of Agriculture, will give a seminar on “Careers in Government: Working as an entomologist for the Oregon Department of Agriculture.” She will speak on Feb. 11 at 4 p.m. in the Agricultural and Life Sciences Building, room 4000. For more information, contact Emmalie Goodwin at Emmalie.Goodwin@oregonstate.edu. Walter Hamady and the Extravagance of Letterpress: Walter Hamady is a publisher, artist and poet celebrated for his inventive approach to bookmaking and the printed arts. In this talk, Karen Holmberg, who teaches creative writing in the School of Writing, Literature, and Film, will discuss how Hamady engages extravagance — visual, material, and temporal — to explore and press meaning from each convention of book and page. Monday Feb. 11, 4 p.m., Autzen House, 811 SW Jefferson Ave.
Science Pub: Benjamin Dalziel, an assistant professor in Oregon State University’s College of Science, will discuss his research on how the flu virus is transmitted at the Corvallis Science Pub on Monday, Feb. 11. The presentation will start at 6 p.m. at the Old World Deli, 341 2nd St. in Corvallis. It is free and open to the public. Due to the continuing popularity of Science Pub, attendance will be limited and advance registration will be required. Registration is at https://bit.ly/2W9hfRE or by calling University Events at 541-737-4717. People who arrive without a ticket are welcome but will not be admitted to the reserved seating area until 6 p.m.
Social Impact Lab: Oregon State University and the United Way of Benton, Lincoln and Linn counties invite you to attend the first Social Impact Lab, a community-wide event that highlights the power of community engagement toward social change. The event will highlight partnerships between community organizations and OSU and provide participants an opportunity to explore and discover other possibilities within our local community. Guest speakers will provide brief TED-style talks about the power of their partnerships and time will be allotted for tabling and networking. Join us on Feb. 13 at CH2M Hill Alumni Center. Doors open 2 p.m. Free, but registration is required. NEW! Get Food, Give Food: When you make a purchase at Panda Express on Feb. 12, ask them to enter promo code 263570 and they will donate 20 percent of the sale Linn Benton Food Share. Wine Gift Basket Raffle: COE-EECS is raffling off two wine gift baskets. Each gift basket will contain a bottle of white/red wine, $10 gift card to Beaver Cheese & Clark Meat Science Center, and more. Tickets are $2, and on sale Feb. 4-13, and can be purchased in Kelley Engineering 1148 during regular office hours. 8 a.m. to 5 p.m. while the office is open. Closed for lunch from noon-1 p.m. For more information contact sherry.barrett@oregonstate.edu. Baby Photo Contest: Feb. 7-11 at the ILLC Welcome Desk. For more information contact erin.wirkkala@oregonstate.edu. Bingo! Bingo! Bingo! Get your bingo fix and help the local food bank. Business Affairs is hosting a virtual bingo game. Stop by Kerr B100 to get your bingo card - $1 each or 6 for $5. Cards will be sold through Feb. 15 with bingo numbers announced each weekday starting Feb. 18 on the BAFF Food Drive page. Winner receives 50 percent of the proceeds; the other 50 percent will be donated to the Food Drive. For more information contact patty.deluca@oregonstate.edu. Hot Chocolate and Cider Break: Warm up during the month of February (4-28). Stop by Gilmore Hall 116 for $1 hot chocolate and cider every weekday from 8-5. For questions, contact jennifer.cohen@oregonstate.edu. Printing & Mailing Services' Annual Food Drive: Drop off non-perishable food or cash to the Xpress Stop during the month of February: $1 or two cans of food to spin the wheel and every spin wins a prize. Gift Basket Raffle: EESC is raffling off four gift baskets. There will be a movie basket, Valentine's Day basket, book basket and gardening basket. Drawings take place each Thursday. Tickets are 1/$1 or 6/$5. See Noelle Mills or Pete Petryszak in Kerr Administration Building 422 for tickets. For questions, contact Noelle.Mills@oregonstate.edu. BEE Girl Scout Cookie Raffle: Get your hands on three boxes of coveted Girl Scout Cookies, including the new Caramel Chocolate Chip. Stop by Gilmore Hall 116 to purchase your $1 tickets. Drawing on Feb 28. FMI email Jennifer.cohen@oregonstate.edu. Valentine's Day Card Sale: The AMBC will be selling one-of-a-kind handmade Valentine's Day cards in Hovland 108 from Feb. 1-14 to support the Linn-Benton Food Share. Cards are $2 each. Questions? Contact April Cummings at april.cummings@oregonstate.edu. Book and DVD Sale: Purchase lightly used books, DVDs and board games to support the 2019 OSU Food Drive. Items range $1 to $5. The sale will be running all month in the Magruder Hall lobby. For questions, contact Sara.k.smith@oregonstate.edu. Quilt and Wood Raffle Ticket Sale: Raffle tickets are $1 each or six tickets for $5 and can be purchased at the Forestry HelpDesk in Richardson Hall throughout the month of February. The drawing will be on Feb, 28 at 1 p.m. For more information contact Jessica.Fitzmorris@oregonstate.edu. Bulb Sale: Are you ready for spring? Get your bulbs now. You can order directly from Dutch Mills Bulbs by visiting the Business Affairs fundraising page or stop by Kerr B100 to place your order. Each kit is $10 and will arrive in time for your spring planting. Orders must be received by Feb. 27. NEW! Seeking nominations for O&E Vice Provost Awards for Excellence: The Awards for Excellence reward efforts to create and nurture healthy communities, planet and economy through outreach and engagement. If you – faculty, staff, or students – have taken part in, or know of, an outreach and engagement project implemented in the past five years that is deserving of special recognition, please submit nominations by Feb. 28. You can self-nominate or nominate others. Visit http://outreach.oregonstate.edu/initiatives/vice-provost-awards, or call 541-737-1327 for information. Scientists sought for NSF study: The Center for Research on Lifelong STEM Learning is looking for OSU scientists who would like to participate in a new NSF-funded research study about using audience feedback during outreach and public engagement activities and events. They are recruiting scientists (including graduate students, postdocs and extension specialists) who are conducting outreach and public science and engineering engagement activities to serve as “Design Testers” in the initial phase of our research. After a short training, Design Testers will test audience feedback strategies during their own outreach events over the course of about one year and provide feedback on their experience. There will be a stipend of $400. The application can found here. Applications are due by Feb. 11. For questions, contact Kari O’Connell (PI and senior researcher) at Kari.oconnell@oregonstate.edu or Kelly Hoke (research analyst) at Kelly.hoke@oregonstate.edu. Research Equipment Reserve Fund (RERF): The Research Office is now accepting applications for the RERF. The budget this year is expected to be $400,000. Research Equipment Reserve Funds (RERF) may be used to acquire, repair, renovate, or improve equipment directly used for research. The equipment may be inventoried capital equipment (defined as =>$5,000 per unit), or fabricated capitalized equipment. Proposals are due by Friday, March 15, 5 p.m. Firm deadline. Questions: Contact Research Office Incentive Programs at: Incentive.Programs@oregonstate.edu. NEW! Student Health Services invites applications for a full-time (1.0 FTE), 12-month, Operating Systems Network Analyst Posting #P01970CT. Closes Feb. 19. NEW! Student Health Services invites applications for a full-time (1.0 FTE), 12-month, Director of Prevention and Wellness. Posting #P02751UF. Closes Feb. 20. NEW! Education Program Assistant 1: This is part-time (approximately 18 hours per week), Education Program Assistant 1 (EPA1) for OSU Extension Service Family and Community Health (FCH). This is a limited-duration expected to last approximately one year from the date of employment. This position will be located in Portland, Oregon. Posting #P01972CT. Closes Feb. 21. NEW! Juntos Statewide Leader: The Division of University Outreach and Engagement at Oregon State University is seeking a Juntos Statewide Leader. This is a full-time (1.00 FTE) 12-month, fixed-term professional faculty position. Reappointment is at the discretion of the OSU Open Campus & Strategic Innovation Leader. Posting #P02753UF. Closes March 8. “Look what you’ve already come through! Don’t deny it. You’ve already come through some things, which are very painful. If you’ve been alive until you’re 35, you have gone through some pain. It cost you something. And you’ve come through it. So at least look at that. And have a sense to look at yourself and say, “Well, wait a minute. I’m stronger than I thought I was." ~ Maya Angelou. Corvallis: Chance of snow before 10 a.m., changing to rain by 1 p.m. High 43, low 34. Snow likely Saturday and Sunday. Central Oregon: Snow likely through the weekend, highs in the 20s to mid 30s, lows in the teens to 20s. Newport: Chance of snow in the morning followed by rain, high of 46, low of 36. Snow, sometimes mixed with rain, over the weekend. OSU Today is a daily e-mail news briefing provided by OSU News and Communication Services.